John Jay College of Criminal Justice proudly presents the exhibition Weaving the War 40 Years of Afghan War Rugs from September 16th to October 17th 2010 in the 6th floor gallery. This event is co-sponsored by the Office of the President and the Art and Music Department who invite you to celebrate this show with an opening reception on Monday September 16th from 5-7 PM. For centuries hand woven rugs have been an important part of Islamic culture and trade between people throughout the Middle East and beyond. The weaving traditions of Afghanistan have been one of the most prolific and well developed rug traditions in the world. Weaving the War, 40 Years of Afghan War Rugs presents a brief yet very important segment of this history. 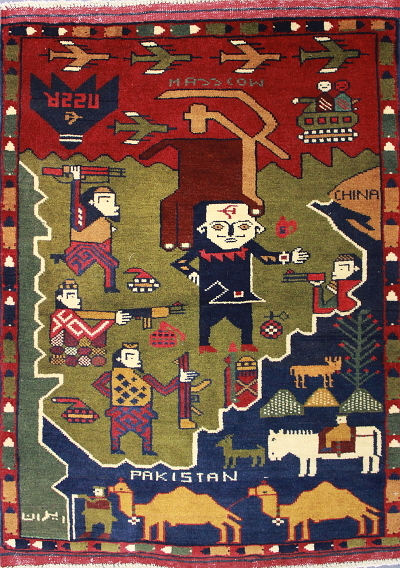 Traditionally known for their imagery of plants, animals and warriors on horseback, Afghan rugs began incorporating more militaristic imagery with the invasion of the Soviet Union in 1979. Since the Soviet-Afghan war, the imagery has continued to evolve to reflect the subsequent rise of the Taliban, the 9/11 terrorist attacks, and the current U.S. led engagement in the region. 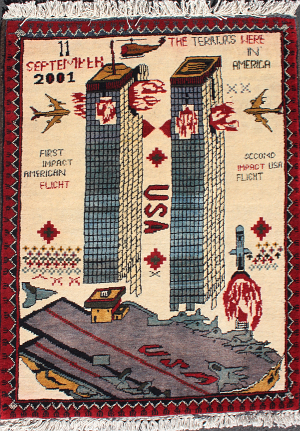 Images of tanks, helicopters, fighter jets, soldiers and even the twin towers have been incorporated into traditional rug patterns creating a time line of events, which have impacted the country. Because of the conflict in the region, many people fled Afghanistan to set up rug weaving workshops in Pakistan and Iran. This has led weavers, traditionally women, to incorporate new materials, techniques and symbols into the hand woven rugs. Today, despite physical displacement and influence from outside sources, there are a rich variety of sizes, types and genres produced. Map and landscape rugs depict the country, but also cities within Afghanistan and the larger region. 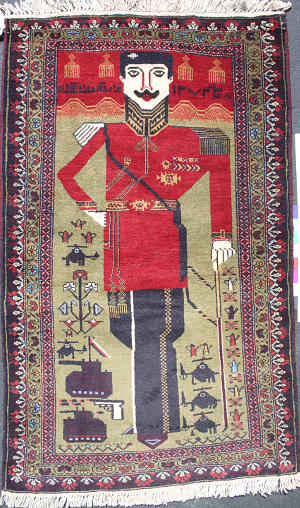 Portraits of important political and military figures constitute another important category of rugs. The most prevalent imagery however is weaponry. Rugs depicting weapons can be sub-categorized by red rugs, or rugs consisting of a single background color with a field of weapons spread throughout. Two other subcategories of weapon rugs include embedded weapons woven into the background in support of more traditional imagery such as mythological figures and animals, and unexploded ordnance rugs, which warn people not to touch dangerous weapons such as land mines and grenades. War on Terror rugs are one of the most recent developments usually combining imagery such as flags, white doves and 9/11. The artwork for the exhibition has been generously loaned by Kevin Sudeith, an avid collector and scholar of Afghani rugs and owner of warrug.com. John Jay College would like to thank him for his support of this exhibition. For further information please contact: Professor Roberto Visani at 212-237-8348. Weaving the War: 40 Years of Afghan War Rugs John Jay College President's Gallery 899 Tenth Avenue Upper West Side September 16 - October 17, 2010 Reception: Thursday, September 16, 5 - 7 PM John Jay College of Criminal Justice proudly presents the exhibition Weaving the War 40 Years of Afghan War Rugs from September 16th to October 17th 2010 in the 6th floor President�s gallery. This event is co-sponsored by the Office of the President and the Art and Music Department who invite you to celebrate this show with an opening reception on Thursday September 16th from 5-7 PM. For centuries hand woven rugs have been an important part of Islamic culture and trade between people throughout the Middle East and beyond. The weaving traditions of Afghanistan have been one of the most prolific and well developed rug traditions in the world. Weaving the War, 40 Years of Afghan War Rugs presents a brief yet very important segment of this history. Traditionally known for their imagery of plants, animals and warriors on horseback, Afghan rugs began incorporating more militaristic imagery with the invasion of the Soviet Union in 1979. Since the Soviet-Afghan war, the imagery has continued to evolve to reflect the subsequent rise of the Taliban, the 9/11 terrorist attacks, and the current U.S. led engagement in the region. Images of tanks, helicopters, fighter jets, soldiers and even the twin towers have been incorporated into traditional rug patterns creating a time line of events, which have impacted the country. Because of the conflict in the region, many people fled Afghanistan to set up rug weaving workshops in Pakistan and Iran. This has led weavers, traditionally women, to incorporate new materials, techniques and symbols into the hand woven rugs. Today, despite physical displacement and influence from outside sources, there are a rich variety of sizes, types and genres produced. 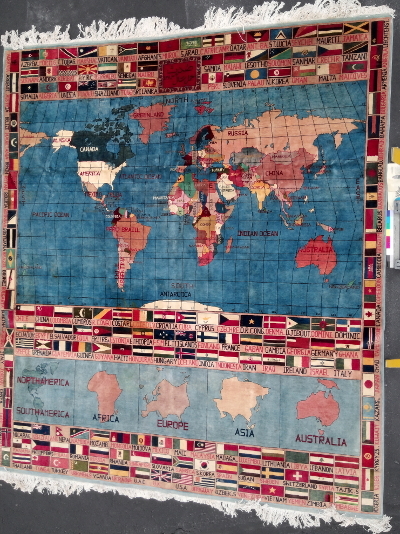 Map and landscape rugs depict the country, but also cities within Afghanistan and the larger region. Portraits of important political and military figures constitute another important category of rugs. The most prevalent imagery however is weaponry. Rugs depicting weapons can be sub-categorized by red rugs, or rugs consisting of a single background color with a field of weapons spread throughout. Two other subcategories of weapon rugs include embedded weapons woven into the background in support of more traditional imagery such as mythological figures and animals, and unexploded ordnance rugs, which warn people not to touch dangerous weapons such as land mines and grenades. War on Terror rugs are one of the most recent developments usually combining imagery such as flags, white doves and 9/11. The artwork for the exhibition has been generously loaned by Kevin Sudeith, an avid collector and scholar of Afghani rugs and owner of warrug.com. John Jay College would like to thank him for his support of this exhibition.